With her thought-provoking installations and compelling Cairo-based photography, Rana El Nemr is making a profound mark on the international art scene. Downtown Cairo has long been a bustling centre for arts, culture and creativity. And tucked away on Kasr El Aini Street in the throbbing heart of the old-town is Rana El Nemr’s studio; resting serenely in the buffer zone between Cairo’s elite and poor. The area is calm, relaxed and a stone’s throw away from the glitz of Garden City on one side and the ghettos of Sayida Zeinab on the other. And it’s that division that inspires her work. 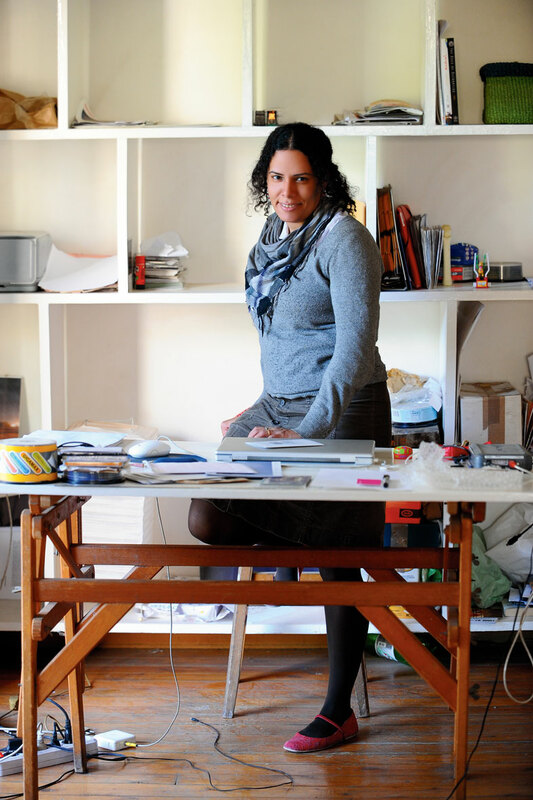 Her work space is a major reflection of her aesthetic and social drive. A haven for artists, it overlooks a small street that’s a nostalgic throwback to the Cairo of yesteryear; downtown at its most glorious. And El Nemr embodies that spirit. The aesthetic heyday of a forgotten Egypt captured through her lens and installations. The studio is flooded in natural light, minimal with bursts of bright colour and an instant comfort. She is not an artist plagued with mess; she is concise, smooth and controlled – much like her work. With her big curls, layered scarves and calm demeanor, she is deeply observant of her surroundings. And she is at the pulse of society; as her work is introspective without compromising the aesthetic principles of the art world. Yet El Nemr was not always an artist; she graduated from the American University in Cairo with a degree in mass communications and a minor in art. She began her career as a photojournalist, out on the streets capturing the images of the country. Needing time to garner her independence and gain control over her work, El Nemr decided to go out on her own and start using her own vision. She calls herself a conceptual photographer, but also works on collages and installations. 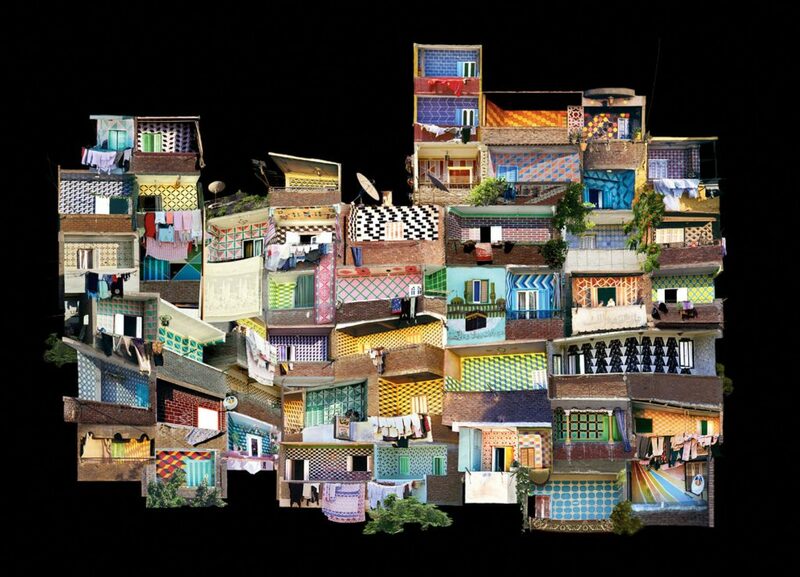 Her work is a depiction of the people and the place; a social retrospective of sorts, encompassing the lifestyles of the multitude of strata in Egyptian society. “No one is qualified to give me messages and I’m not qualified to give anyone messages. I’d rather pose questions and receive questions than give out statements,” she says of her work. To date, El Nemr has displayed her projects in all corners of the globe, from New York to Denmark, Paris to Tokyo and even London and Madrid. Her projects pose a question and are not just aesthetic pieces. Her work has been used by specialists including anthropologists, architects and sociologists and is on sale at Diwan in Cairo. One particular project involved taking pictures of the balconies of the Egyptian ‘ghetto’. The photographs depict makeshift houses with brightly coloured balconies. “The balconies are the positive voices of these areas, expressing Egypt as bright and colourful in the midst of despair. This display, of what is essentially a private part of the home, to the rest of the world is a positive aspect of the Egyptian people.” Her latest project is exhibited in Photo Cairo Egypt 2008 at the Townhouse Gallery. It is focused on Cairo’s Olympic Gardens; the new barricades built to hide the shanty towns of a burnt down ghetto. They are rife with graffiti from the people trapped by these walls; and El Nemr’s work is a metaphorical look at life behind the barricades. And it’s not just done through pictures but by talking to the people and getting their insight. “It is a site-specific project concerned with a specific space which has a very important geographic location. A mysterious fire that abolished life; I’m investigating the dynamics of this piece of land and the survival and the intricacies of life there.” Thankfully El Nemr’s work hasn’t gone unnoticed, with various prestigious international accolades coming her way including a nomination for the Paul Huf Young Photographer of the Year Award from the Netherlands.